Eesti Pank also approves the rules and principles for payment systems being set up by payment institutions and participates in the cooperative oversight work of the Eurosystem. TARGET2-Eesti is a component system of TARGET2, the Trans-European Automated Real-time Gross Settlement Express Transfer System, and is managed by Eesti Pank. TARGET2 settles payments in euros, in real time and one by one on a continuous basis. This system is for the settlement of express payments. TARGET2 is a systemically important payment system (SIPS) because of its financial impact and its interdependencies with other financial market infrastructures. TARGET2 and its component systems are subject to exceptions from the oversight requirements for SIPSs that apply to systems owned and operated by Eurosystem central banks. The overseer of TARGET2 is the European Central Bank. Central banks of the Eurosystem can contribute to the oversight of TARGET2 on a voluntary basis. Eesti Pank has responsibility for oversight of the TARGET2-Eesti component system. In its oversight of TARGET2-Eesti, Eesti Pank focuses on monitoring and analysis. The component system is not subject to separate assessment and separate recommendations are not made for it. Such things are a part of the Eurosystem-level oversight and Eesti Pank is involved with them in accordance with the principles of participation in Eurosystem oversight. The securities settlement system managed by the ECSD allows individuals to settle transactions with financial instruments, or securities. Securities settlement systems are systemically important because of their critical role and the oversight requirements for securities settlement systems apply to them. Eesti Pank has responsibility for oversight of the securities settlement system. Eesti Pank works with the Financial Supervision Authority in overseeing the securities settlement system under an agreement signed in 2011. The securities settlement system managed by the ECSD is subject to oversight by Eesti Pank through monitoring, analysis, assessment and recommendations. The card payment system operated by Nets Estonia AS processes card payments. Interbank obligations arising from the processing of card payments are settled by interbank payment systems. The card payment system is an important payment system because of its high market share and its impact on the smooth functioning of currency circulation. The requirements for prominently important payment systems apply to card payment system. The card payment system managed by Nets Estonia AS is subject to oversight by Eesti Pank through monitoring, analysis, assessment and recommendations. 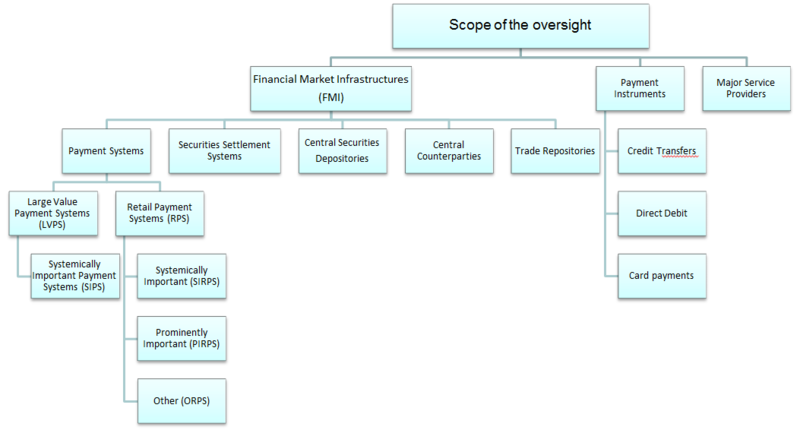 Oversight of the financial market infrastructures at the Eurosystem level covers payment systems, securities settlement systems, central securities depositories, central counterparties and trade repositories. Central banks also contribute to oversight of important payment instruments and major third-party service providers (see Figure below). The retail payment system STEP2 operated by EBA Clearing is a financial market infrastructure that is subject to oversight at the Eurosystem level and is important for the settlement of obligations between Estonian market participants. STEP2 is a systemically important payment system, which is subject to the oversight requirements for systemically important payment systems. The overseer of STEP2 is the European Central Bank. Central banks of the Eurosystem can contribute to the oversight of STEP2 on a voluntary basis. Eesti Pank participates indirectly in pan-European oversight through working groups, and directly in the STEP2 oversight where necessary and possible.